Here you will find information on the events that the branch or members of the branch will be present at, these will be a combination of our own events and other events that we take part in. At the moment the list also includes national/local events that we may not be at but that may be of interest to our membership. Events will be listed in chronological order for ease of navigation. Our regular monthly meetings are listed on a separate page, here. Where events are externally organised we will endeavour to provide an organiser’s contact details here too. For our own events please refer to the contact details on the Contact the Guild page, here. Come rain or shine, start the season with this now traditional informal gathering. Models of all sorts – railway layouts, model buses and trams – something for everyone to enjoy. This event follows on from the Pride Of Longbridge and starts with a meet at Studley Castle on the Saturday night, followed by a show at Motor Heritage Centre, Gaydon on the Sunday. As many Wedgwood Blue Dealer launch cars within the club as possible will be displayed in a line alongside the first Production 75, which Gaydon owns, itself a Dealer Launch 2.5 Connoisseur. See Federation of British Historic Vehicle Clubs website for local/regional events. Or just drive your Rover near you, to get classic cars noticed. The rally will start at 10am. Entry price held at £7 per head for the second year running, which includes entry to the gardens, steam museum and rides on the three narrow gauge steam railways. This is the charge made to us by the Bressingham Trust and represents a considerable reduction on the normal entry price. As those who have been before will know, Bressingham is a very attractive venue but space is limited and demand for tickets is always high so please book early to avoid disappointment. Regrettably we cannot guarantee entry for those who have not pre-booked. The major classic car event in the North London area. Based around Bury St Edmunds. Sunday static show at Ickworth House. Contact Bryan Leggate on 01790 763344 or write to The Old Smithy, Old Bollingbroke, Nr. Spilsby, Lincs., PE23 4HG. At East Kirkby Aviation Heritage Centre, near Spilsby, Lincolnshire PE23 4DE. Home of the Avro Lancaster 'Just Jane'. 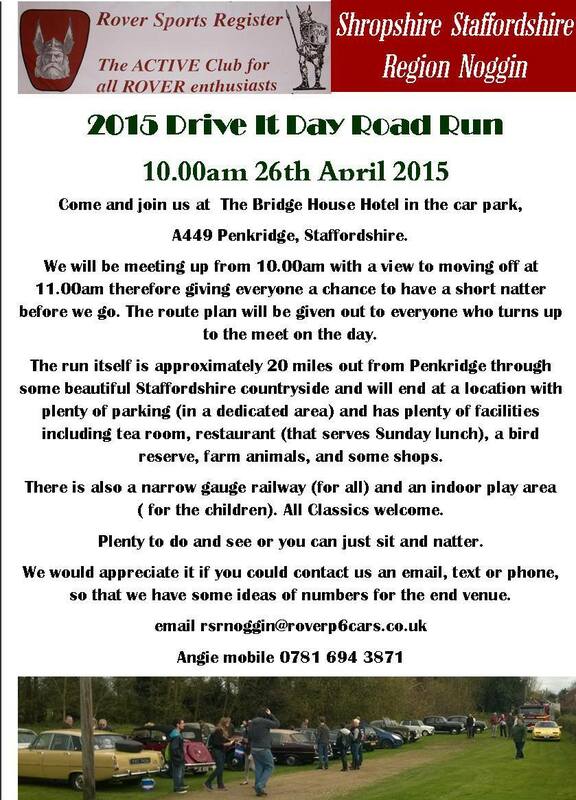 All Rovers and other Classic Cars welcome. Advance booking and pre-payment of admission fee of £7.00 is essential. All proceeds to the Centre Funds. Oxfordshire, at Blenheim Palace. Well known father and daughter team Dave and Brenda Griffin are organizing an overdue return to this venue. E-mail: dc.griffin1@tiscali.co.uk or 01252 837454. Book by sending £5 cheque, payable to ‘The Rover P4 Drivers' Guild’ to Stan Johnstone, 54 Ingaway, Lee Chapel South, Basildon, Essex SS165QR or online, early in the new year, at www.roverp4dg.org.uk Tel. 07958 962751 for more information.